The director of project management takes the overall responsibility for project management functions. 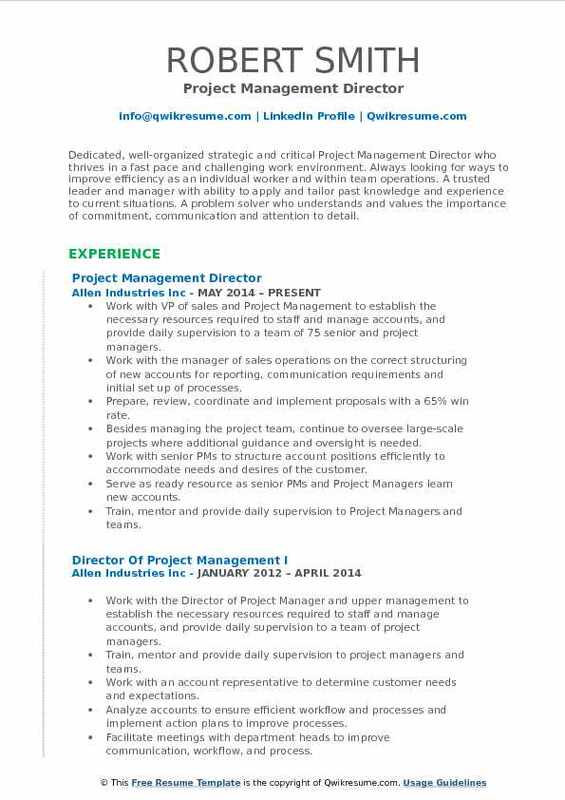 The job description for this role additionally includes various other tasks such as providing leadership to juniors, supervising the team leading the project, facilitating project approvals, project deliverables; ensuring that the projects get completed on time, assessing team performance, controlling project budget, allocating resources and managing project from concept to finish. 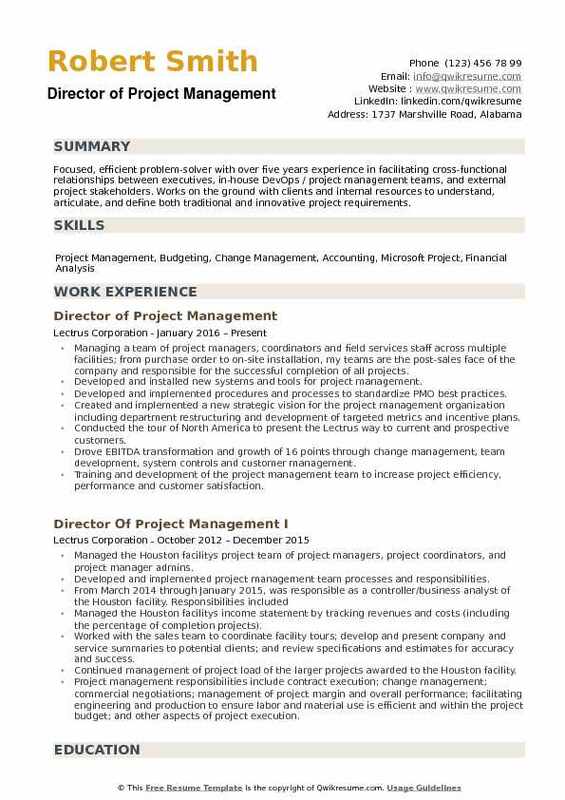 Most of the Director of Project Management resume lists essential qualifications such as – project management expertise, deadline orientation; knowledge of the related project, solid technical background, and understanding of related software and web technologies, client-facing abilities, and multi-tasking skills. A Bachelor’s degree in the field of management or business administration is the common education required for this job designation. Headline : Project Manager / Industrial Engineer with a background and skillset that is focused on deliverables, pursuing a stimulating and challenging opportunity in a cutting-edge manufacturing environment. Managed a portfolio of cross-functional projects from original concept through final implementation. Focused management efforts on ensuring the various activities were coordinated, critical path activities are achieved and projects were successfully completed on time and within budget, adhere to high-quality standards, and meet customer coordinated activities and tasks among project team members, other internal departments, and external organizations as needed to meet project goals and ensure project completion was on schedule. Ensured appropriate communication with all internal and external stakeholders regarding impacts to scope, status, and budget. Directed project closure activities including formalized and communicated the project acceptance; gathered lessons learned; Completed documentation; hand-off of project deliverables; transitioned mutually agreed upon issues to downstream; Functional groups; and completed post-implementation review to identify areas of improvement. Coached and mentor team members on a customer-oriented approach, and my expectations for performance and communications while establishing standards for performance evaluation. Coordinated the activities of the estimation team and provided technical and business guidance to team members as well as feedback and scheduling. Obtained competitive component pricing from the supply base for the purpose of providing quotes and proposals to our project. Initiated and maintained good working relationships with suppliers, negotiating costing and lead times, and providing feedback on vendor performance. Provided customer support on new projects, including customer site visits, working with outside and inside sales to ensure the profit. 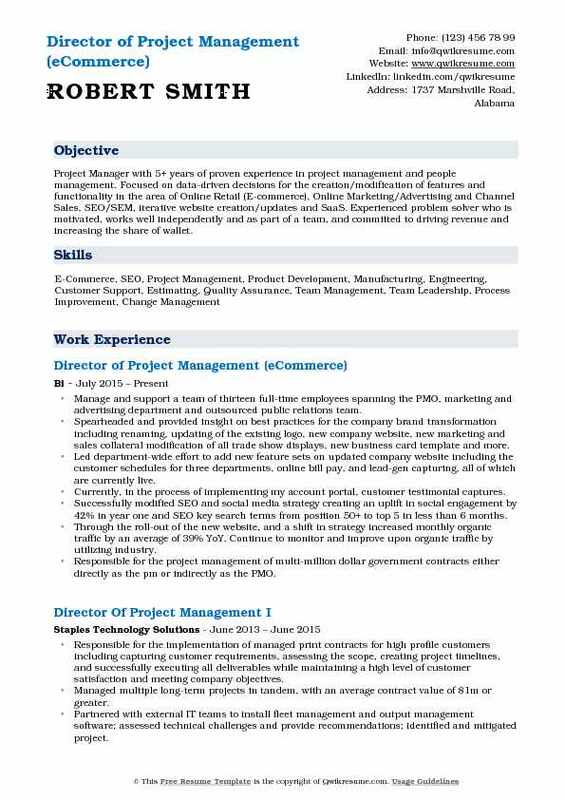 Summary : Senior Level technology professional with in-depth experience in Project Management. Constantly strives to match the correct technology with the organization. Reputation for providing high-quality applications while consistently delivering enterprise, high-quality, projects on time and on budget. Manage professional staff (20+) and implement best practices across the full project lifecycle. Established the PMO organization structure, hiring and managing staffing requirements in line with project objectives. Provided project management team leadership by overseeing the delivery of projects/programs on time, within the scope and on budget. Interfaced with executives to define project priorities and implementation opportunities and challenges, and kept them up-to-date with project risks and opportunities. Responsible and accountable for the coordinated management of high profile projects directed toward strategic business and other organizational objectives. Manage financial aspects of projects including budgeting, estimate to actual variance and capital project management. 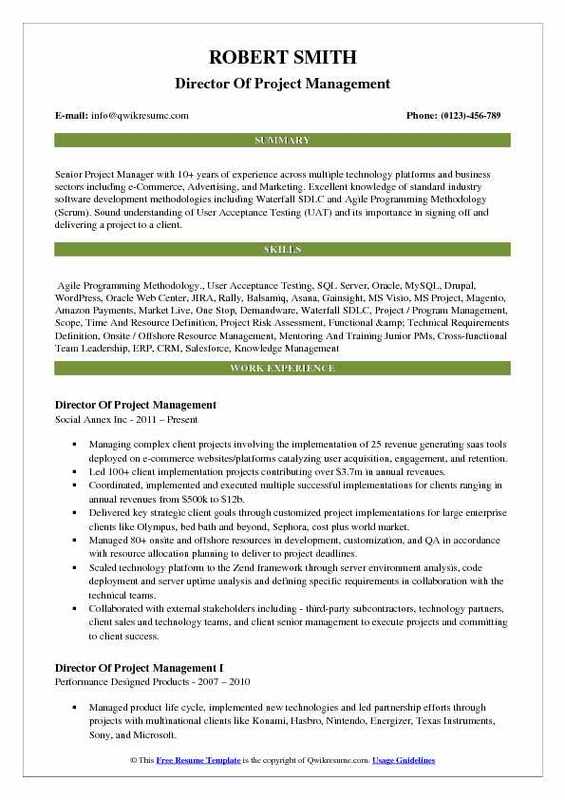 Summary : Senior Project Manager with 10+ years of experience across multiple technology platforms and business sectors including e-Commerce, Advertising, and Marketing. Excellent knowledge of standard industry software development methodologies including Waterfall SDLC and Agile Programming Methodology (Scrum). Sound understanding of User Acceptance Testing (UAT) and its importance in signing off and delivering a project to a client. Managing complex client projects involving the implementation of 25 revenue generating saas tools deployed on e-commerce websites/platforms catalyzing user acquisition, engagement, and retention. Led 100+ client implementation projects contributing over $3.7m in annual revenues. Coordinated, implemented and executed multiple successful implementations for clients ranging in annual revenues from $500k to $12b. Delivered key strategic client goals through customized project implementations for large enterprise clients like Olympus, bed bath and beyond, Sephora, cost plus world market. Managed 80+ onsite and offshore resources in development, customization, and QA in accordance with resource allocation planning to deliver to project deadlines. Scaled technology platform to the Zend framework through server environment analysis, code deployment and server uptime analysis and defining specific requirements in collaboration with the technical teams. Collaborated with external stakeholders including - third-party subcontractors, technology partners, client sales and technology teams, and client senior management to execute projects and committing to client success. Delivered projects on e-commerce platforms and led certification of social annex modules on amazon payments, Magento, Marketlive, Onestop, Demandware. Headline : Dedicated, well-organized strategic and critical Project Management Director who thrives in a fast pace and challenging work environment. Always looking for ways to improve efficiency as an individual worker and within team operations. A trusted leader and manager with ability to apply and tailor past knowledge and experience to current situations. A problem solver who understands and values the importance of commitment, communication and attention to detail. 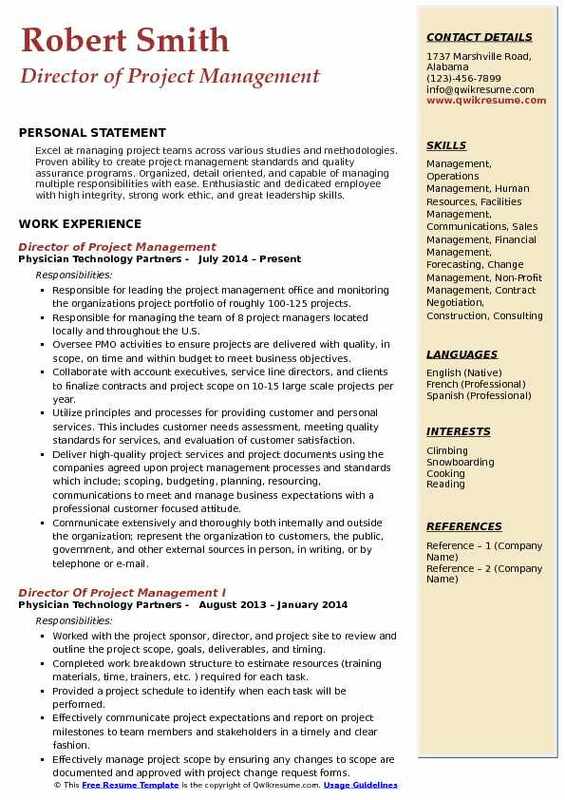 Skills : Project Management, Process Scheduler, Contract Management, Contract Negotiation, Customer Service, Project Estimator, Pre-Construction, Change Orders, Program Management, Contractors, Project Planning, Teamwork, Budgets, Construction, Renovation, Team Building, Communication, Prioritization, Accountability, Project Urgency. Work with VP of sales and Project Management to establish the necessary resources required to staff and manage accounts, and provide daily supervision to a team of 75 senior and project managers. Work with the manager of sales operations on the correct structuring of new accounts for reporting, communication requirements and initial set up of processes. Prepare, review, coordinate and implement proposals with a 65% win rate. Besides managing the project team, continue to oversee large-scale projects where additional guidance and oversight is needed. Work with senior PMs to structure account positions efficiently to accommodate needs and desires of the customer. Serve as ready resource as senior PMs and Project Managers learn new accounts. Train, mentor and provide daily supervision to Project Managers and teams. Verify availability of Project Managers in preparation of additional work. Modify reports as needed to assist in the quick review of numbers, personnel, etc. 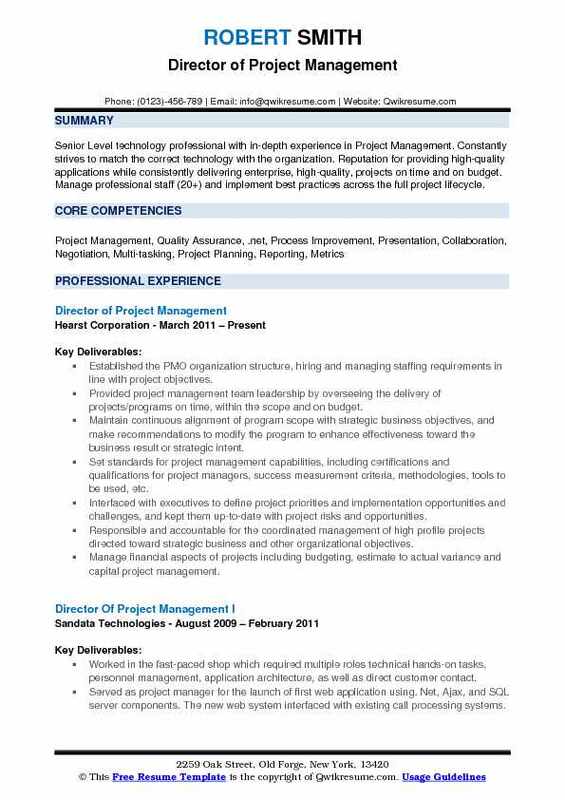 Summary : 13+ years of experience as Product Manager, and later as Director of Project Management. 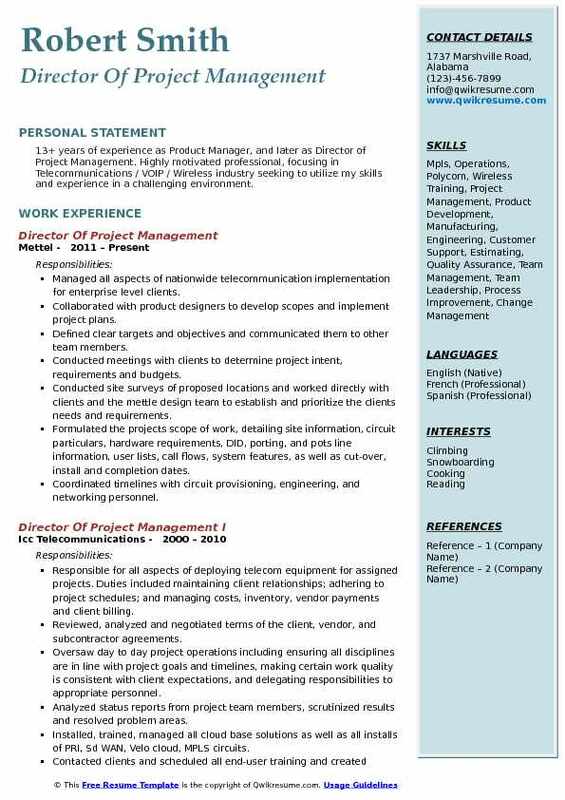 Highly motivated professional, focusing in Telecommunications / VOIP / Wireless industry seeking to utilize my skills and experience in a challenging environment. Managed all aspects of nationwide telecommunication implementation for enterprise level clients. Collaborated with product designers to develop scopes and implement project plans. Conducted site surveys of proposed locations and worked directly with clients and the mettle design team to establish and prioritize the clients' needs and requirements. Formulated the project's scope of work, detailing site information, circuit particulars, hardware requirements, DID, porting, and pots line information, user lists, call flows, system features, as well as cut-over, install and completion dates. Coordinated timelines with circuit provisioning, engineering, and networking personnel. Traveled extensively to oversee the deployment, testing, and troubleshooting of hardware, and ensured complete system functionality. 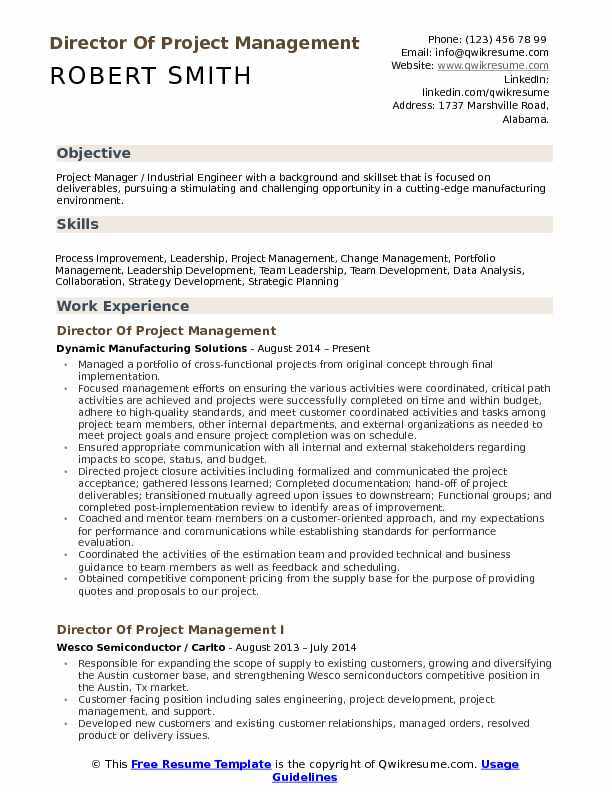 Headline : Project Manager with 5+ years of proven experience in project management and people management. Focused on data-driven decisions for the creation/modification of features and functionality in the area of Online Retail (E-commerce), Online Marketing/Advertising and Channel Sales, SEO/SEM, iterative website creation/updates and SaaS. Experienced problem solver who is motivated, works well independently and as part of a team, and committed to driving revenue and increasing the share of wallet. Manage and support a team of thirteen full-time employees spanning the PMO, marketing and advertising department and outsourced public relations team. Spearheaded and provided insight on best practices for the company brand transformation including renaming, updating of the existing logo, new company website, new marketing and sales collateral modification of all trade show displays, new business card template and more. Led department-wide effort to add new feature sets on updated company website including the customer schedules for three departments, online bill pay, and lead-gen capturing, all of which are currently live. Currently, in the process of implementing my account portal, customer testimonial captures. Successfully modified SEO and social media strategy creating an uplift in social engagement by 42% in year one and SEO key search terms from position 50+ to top 5 in less than 6 months. Through the roll-out of the new website, and a shift in strategy increased monthly organic traffic by an average of 39% YoY. Continue to monitor and improve upon organic traffic by utilizing industry. Responsible for the project management of multi-million dollar government contracts either directly as the pm or indirectly as the PMO. Implemented more government contracts than any other project manager in the country that operates within this sector. Personally implemented 5 of the 6 existing government contracts won by Biotrack with a total contract value of $2. 3m base plus recurring annual fees and out of scope. Headline : A dedicated professional in commercial interiors with experience in all aspects of Project Management. Client-oriented and work well in progressive teams with a long-term approach to growth through client satisfaction. My objective is to join an organization where my customer-centric values and managerial experience will contribute to its success. 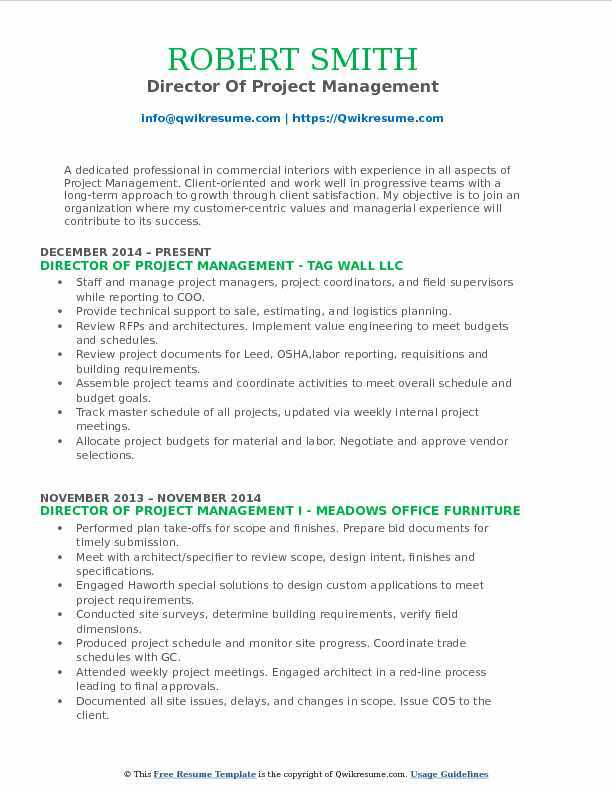 Staff and manage project managers, project coordinators, and field supervisors while reporting to COO. Provide technical support to sale, estimating, and logistics planning. Review RFPs and architectures. Implement value engineering to meet budgets and schedules. Review project documents for Leed, OSHA,labor reporting, requisitions and building requirements. Assemble project teams and coordinate activities to meet overall schedule and budget goals. Track master schedule of all projects, updated via weekly internal project meetings. Allocate project budgets for material and labor. Negotiate and approve vendor selections. Review POs, contracts and project documents for accuracy of value, scope, and terms. Engage architect on submittals and red-lines to secure final approval. 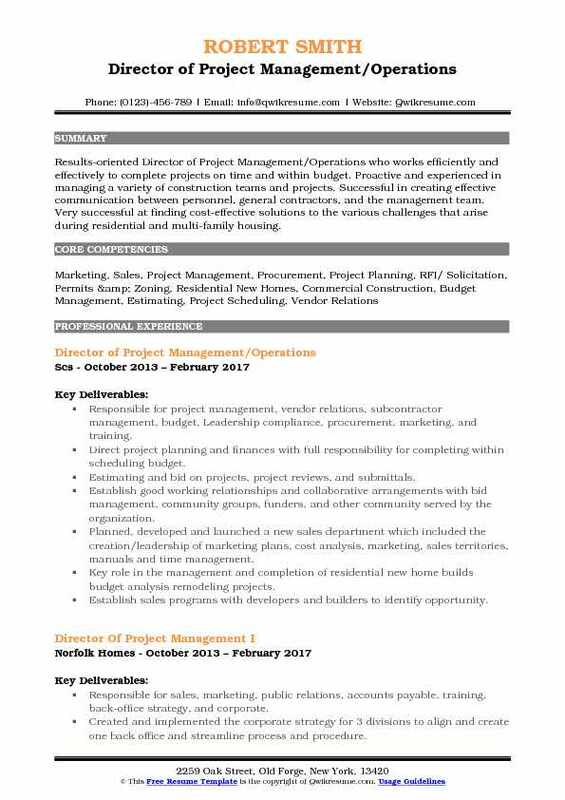 Headline : Results-oriented Director of Project Management/Operations who works efficiently and effectively to complete projects on time and within budget. Proactive and experienced in managing a variety of construction teams and projects. Successful in creating effective communication between personnel, general contractors, and the management team. Very successful at finding cost-effective solutions to the various challenges that arise during residential and multi-family housing. Responsible for project management, vendor relations, subcontractor management, budget, Leadership compliance, procurement, marketing, and training. Direct project planning and finances with full responsibility for completing within scheduling budget. Estimating and bid on projects, project reviews, and submittals. Establish good working relationships and collaborative arrangements with bid management, community groups, funders, and other community served by the organization. Planned, developed and launched a new sales department which included the creation/leadership of marketing plans, cost analysis, marketing, sales territories, manuals and time management. Key role in the management and completion of residential new home builds budget analysis remodeling projects. Establish sales programs with developers and builders to identify opportunity. Created and monitored subcontractor performance and evaluated the quality of the work. Headline : Excel at managing project teams across various studies and methodologies. Proven ability to create project management standards and quality assurance programs. Organized, detail oriented, and capable of managing multiple responsibilities with ease. Enthusiastic and dedicated employee with high integrity, strong work ethic, and great leadership skills. Responsible for leading the project management office and monitoring the organization's project portfolio of roughly 100-125 projects. Responsible for managing the team of 8 project managers located locally and throughout the U.S. Oversee PMO activities to ensure projects are delivered with quality, in scope, on time and within budget to meet business objectives. Collaborate with account executives, service line directors, and clients to finalize contracts and project scope on 10-15 large scale projects per year. Utilize principles and processes for providing customer and personal services. This includes customer needs assessment, meeting quality standards for services, and evaluation of customer satisfaction. Deliver high-quality project services and project documents using the companies agreed upon project management processes and standards which include; scoping, budgeting, planning, resourcing, communications to meet and manage business expectations with a professional customer focused attitude. Communicate extensively and thoroughly both internally and outside the organization; represent the organization to customers, the public, government, and other external sources in person, in writing, or by telephone or e-mail. Headline : Focused, efficient problem-solver with over five years experience in facilitating cross-functional relationships between executives, in-house DevOps / project management teams, and external project stakeholders. Works on the ground with clients and internal resources to understand, articulate, and define both traditional and innovative project requirements. Managing a team of project managers, coordinators and field services staff across multiple facilities; from purchase order to on-site installation, my teams are the post-sales face of the company and responsible for the successful completion of all projects. Developed and installed new systems and tools for project management. Developed and implemented procedures and processes to standardize PMO best practices. Created and implemented a new strategic vision for the project management organization including department restructuring and development of targeted metrics and incentive plans. Conducted the tour of North America to present the Lectrus way to current and prospective customers. Drove EBITDA transformation and growth of 16 points through change management, team development, system controls and customer management. Training and development of the project management team to increase project efficiency, performance and customer satisfaction. Responsible for interpreting, contributing to and executing against master supplier agreements and project contracts. Compiled and gave monthly presentations to organizational leaders regarding department metrics and initiatives.